“13TH” was released theatrically October 7th and is available globally on Netflix. Ava DuVernay was joined by Oprah Winfrey for a speaking panel following a screening of her feature documentary film “13TH” at the Museum of Tolerance in Los Angeles, Calif.
An event that was attended by community activists, Rabbi Marvin Hier, the dean and founder of the Simon Wiesenthal Center and Museum of Tolerance introduced the film, which expertly details how incarceration impacts men of color in the United States. With startling interviews, statistics and a mixture of archival footage and testimony from activists, politicians, historians, and formerly incarcerated women and men, DuVernay chronicles how incarceration is the latest in the ongoing subjugation of blacks since slavery was abolished more than 150 years ago. 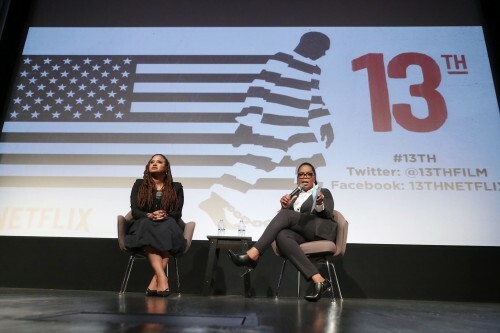 The title of the documentary refers to the 13th Amendment to the Constitution, which reads “Neither slavery nor involuntary servitude, except as a punishment for crime whereof the party shall have been duly convicted, shall exist within the United States.” DuVernay and co-writer Spencer Averick cover 150 years in 100 minutes, from the ratification of the 13th Amendment in 1865 to the recent lethal encounters between black men and police. Media mogul Winfrey and “Selma” director DuVernay are executive producers of the drama series “Queen Sugar,” which airs on the OWN Network.